5:40. I get up. One of my housemates is already hogging the only bathroom. Cheap cigarette smoke blankets the air. I am going to choke. 6:40. Just learned that I have to make a paper star to give out to my “star pupil of the week.” Since I haven’t even started teaching yet, I’m not sure what to do. If I draw a blue star with stripes, little eyeballs, and a smiling mouth, that should make a fifth grader happy, right? 7:15. School assembly begins. Two little girls bring a large flag of Honduras to the center of the stage. Everyone else starts singing the national anthem. Then, all the foreign teachers are called to the stage. Stage fright! My star – even though it’s about the size of my palm – seems to stun its recipient. 8:00. I ask my students if they knew how I had decided this week’s star pupil. General answers are thrown out until a student delivered this knockout punch, “Because he is whiter than the rest of us.” Unbelievable! I’m as Asian as they get. This place is either weird or racist—too early to decide. 8:40. During science class, while explaining the concept of camouflage, I ask if anyone could spell the word “chameleon.” I award the winner with a sticker. All the other students become instantly jealous. 8:55. Time for a mid-morning snack. The national favorite, baleadas, is not bad, but the cheese is some of the saltiest I have ever had. 10:40. A free teaching period just in the nick of time. The picnic table bench is perfect. Reading “Relic” gets me out of a very black mood. 11:20. P. E. but the kids are in no mood to stretch. I switch to some exercises I learned in elementary school in South Korea. Ah, now we are on the same page! 12:00. I’m given a hamburger with French fries and pineapple juice right along with all the other staff. Amazing! Lots of flies and wasps cruise the picnic table looking for any dumb bunny thatisn’t patrolling the air above his/her plate. I’m going to have to learn to bolt my food if I’m going to eat anything clean around here. 12:30. Some of the kids have finished eating and are kicking around a plastic pop bottle like a soccer ball. They’re so fluid. The bottle scuttles across the dirt just like a real soccer ball. 1:30. For oral English, I divide the class into two parts. While one group is speaking, I send the other group next door to the library to finish a vocabulary worksheet. Well, that was the idea at least. Never thought that they might spend their time tossing library books back over the divider and into the classroom. 2:00. The classroom noise level is now hitting record highs. A student comes up and asks me if I am tired. I tell her that I am disappointed because we were going to play a game, but no one is listening. She spreads this news, but it’s too late. I just tell everyone to put their heads down on their desks. They think that this is the game. 2:10. The final bell rings. 2:20. I’m beginning to like this picnic table bench. It feels cool and gives me a quiet spot to think. My students are obviously testing me, but what’s an appropriate response? 3:10 Back home again – if you really can call this rat-infested place a home. The kitchen’s dirty dishes have doubled since the last time I looked. I can’t make dinner in there,and, what am I going to do about these mosquitoes? Apparently, the ones with white and black stripes on their legs carry dengue fever. 3:30. The water is back on. A cold shower never felt so good! 5:30. My request to move to the school’s other house for volunteers just got shot down. Now what? 7:00. Time for bed. Just wish I didn’t share this house with so many noisy night owls. The author is a college student taking a gap year from her studies in the United States. 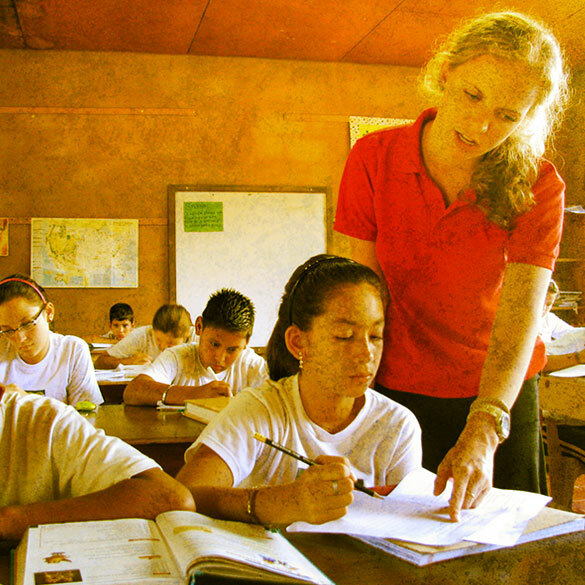 She just recently finished volunteering as a 5th grade teacher at a private, bilingual school in the mountains of Honduras. This entry was posted in Archive, Non-Fiction, Original Lit, Recently Added. Bookmark the permalink.